Isidor’s Tortilla Heaven is the best restaurant in New Mexico, maybe even the world. But though his tortillas are scrumptious, his enchiladas divine, Isidor has never made a dime. Why? He lives in Falfurrias, population 73. One Sunday, while all the town, including his wife and son, are piously praying mass, a miracle occurs. 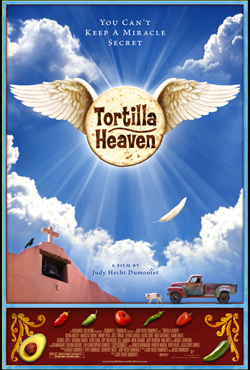 Upon one of his famous, hand-made tortillas appears the face of Jesus Christ.